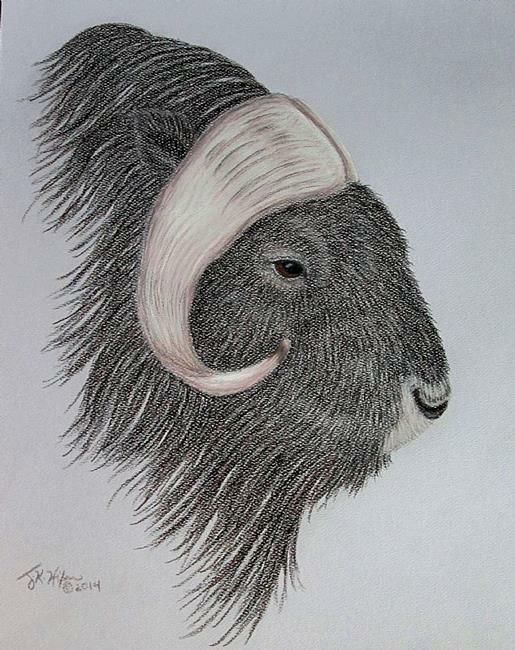 This is a profile of a musk ox, an animal that has always fascinated me with their prehistoric construction and strong family life in a harsh environment. They are native to lands around the Arctic Circle across the top of the globe. When threatened, the herd forms a circle, horns out, with the young in the center. I've always been impressed with that. Done on toned pastel paper, this drawing was fun to do, especially the long flowing hair on the neck and side. For all of their ferocious appearance with the intimidating head gear, they have soft gentle eyes. I hope I've conveyed the multiple feelings these animals provoke in me. Was juried into the Westlake-Westshore Annual Show in 2014.